Stay at home mom’s unite and get inspired to get out of those yoga pants, do your hair, and put a little effort into yourself for a change. A new series to motivate myself to put in a little extra effort each and every day. What I wore Wednesday is a way for Mom’s to share outfits and get inspired to get dressed even if they aren’t heading off to work each day. Becoming a stay at home mom, for me, really took a tole on my personal style and self confidence. Not only does having babies change your body, but it changes the amount of time you have to put into yourself. After I had my second child and became a stay at home mom, my style became non existent. I spent a good two years in yoga pants and t-shirts. I think every stay at home mommy deserves a year or two of t-shirt and jammie pants style. After all, you are going to be spit up on anyway – why bother doing your hair, and getting dressed up? Your baby loves you just the way you are – and that’s A-okay in my book. After spending those years that way I completely lost track of what I liked to wear and had no clue how to dress my post baby body. It’s hard to have confidence when you step out of the house in the clothes you woke up in with your hair tied back day in and day out. I have been following an awesome blog called The Pleated Poppy for well over a year now. She has an amazing series where she shares what she wears each week – to inspire mom’s to put a little effort into themselves and to keep herself accountable for getting out of her pajamas everyday. I have loved following her weekly updates and many other mother’s share their own weekly outfits. I am taking a leap and joining in the fun. I am a t-shirt and jeans kind of girl, and in an attempt to try a little harder, and walk a little taller I am going to share with you my own weekly outfit choices as well. Living in a very rural place, it won’t be fancy, and I stay home, so there will be very few outfits that include heels and pearls, but my hope is to share easy hairstyles and simple outfits for real moms on real budgets. Of course my outfits would look better with 4 inch heels – but I am going to be realistic here – I am chasing kids all day every day. There is rarely money in the budget for clothes for myself, and with two little ones in tow, shopping for clothes happens rarely. I love combining thrift store finds, DIY clothes, and simple basics in my closet to come up with comfy easy outfits that allow me to look and feel decent while running and playing with my kiddos. I am by no means a fashionista, but am hoping this will keep me accountable for putting in that extra effort each day! 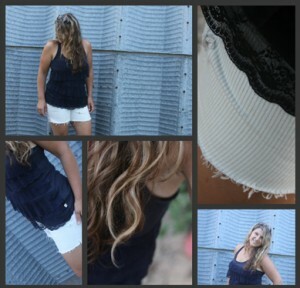 It has been hot here…really hot so shorts and tanks are a must for any kind of outdoor function. Hair : It’s been hot so I’m sticking with natural waves – no matter what I do the are going to happen on summer days – why not embrace it, right? Hair: Overnight Sock Bun curls in a ponytail with an elastic headband. This was after a full day of running around in the summer heat – still a nice little curl left in the ends. Saturday: Children’s Hospital Picnic at the Zoo. Okay – this outfit is cheating, but my proudest outfit of the week. Each year my son’s heart center puts on a picnic for all of the heart patients that go there. 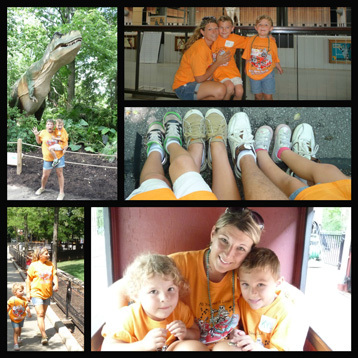 We all get matching shirts and sport them while enjoying day at the zoo together.